The annual meeting of the American Urological Association (AUA) is one of our favorite events of the year. We always look forward to seeing old friends, meeting new ones, and learning from the best and brightest in our specialty. This year is no exception, and we have quite a few specific activities that we’re looking forward to. On Sunday, May 17, Cook Medical and KARL STORZ Endoskope are sponsoring a live surgery broadcast. Attendees will be able to observe Dr. Jorge Gutierrez from Wake Forest Baptist perform a stone removal case using Cook and STORZ products. Attendees will be able to ask questions of Dr. Gutierrez throughout the case. Can you beat last year’s record? We are participating in the AUA Skills Challenge with a station at our booth. See how much weight in stone fragments you can remove from our kidney model. You’ll get one minute to try percutaneously and two minutes for ureteroscopy. Last year, our winner removed 2.69 grams of stone burden. We can’t wait to see who tops that this year. Also this year, residents will have a chance to participate in the Skills Challenge with dedicated times for them to compete alongside their Residents Bowl teams. These scores will be incorporated into the Residents Bowl results. For the fourth year running, Cook and KARL STORZ are sponsoring the Residents Bowl, one of the most popular events of the conference. Come cheer on your section as they compete in a battle of the brains. Competitors will be answering questions on urological subspecialties, the history of urology, and the latest research. You can see Cook products in a whole new way at our booth this year. We’ll have interactive stations set up where you can use the latest technology to see product demonstrations and clinical footage of our exclusive technologies. 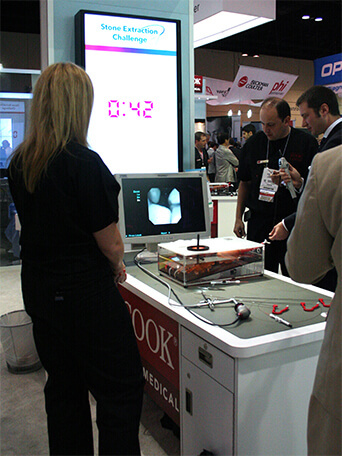 And, we’ll show you how Cook products can be used from start to finish for your PCNL and URS procedures. We’ll be tweeting throughout the conference from @CookUro. Join the conversation using #AUA15. We’ll see you in New Orleans!